Posted December 28, 2011 by Norburn Lighting and Bath Centre & filed under Bathroom Accessories, Bathroom faucets, Kitchen & Bath Plumbing, Kitchen Faucets, New Products . 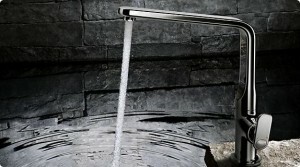 Rooted in the philosophy of Sensual Minimalism, GROHE Ondus® Veris blends sobriety with emotion. Sinuous curves meet soft edges to create a timeless and striking form. 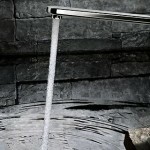 Resonating the same DNA as our award-winning GROHE Ondus® collections, GROHE Ondus® Veris extends this unique aesthetic philosophy to a wider audience. The GROHE design DNA brings harmony to GROHE SPA™ collections and GROHE Ondus® Veris is a shining example. Lozenge-shaped handles bring a soft architectural appeal to the fittings, rings around the bases of spouts and handles hi ghlight an area of purpose, while faucet spouts are pitched at a comfortable angle of 7°. Veris, the bathroom faucet from GROHE, is now also available as a kitchen fitting. It shares the same design philosophy of “Sensual Minimalism”, which is characterised by discreet shapes that are emotional at the same time. In the kitchen, a premium is put on functionality, which is why the lever of the Veris kitchen faucet ensures highly ergonomic operation. The GROHE Joy is not simply parallel to the faucet but positioned at a 7 degree angle, making it even easier and more intuitive to operate. The swivel spout adds to the faucet’s versatility in everyday use.